I would like to emphasize that the information contained in this paper must not be, in any way, shape or form, considered and used in small or large scale operations, whatever their goal. It is only intended as material to be used with great precaution by very skilled and responsible people, under government permission, in a laboratory research setting, aimed at developing the knowledge and protocols to make the Oranur reaction more and more understandable and secure. It was never my intention to spread information that could be used for field applications, either on a small or large scale. I do not, in any way, approve of such actions, and the responsibility lies with the person who might undertake them. In the past many philosophers and scientists hypothesized an ideal society characterized by a perfect understanding and relationship amongst political, social, cultural and scientific realities. Plato’s Res Publica, More’s De Optimo Rei Publicae Statu Deque Nova Insula Utopia, Campanella’s Civitas Solis, and Bacon’s New Atlantis are all discussing and proposing solutions to get the humans to this perfect world. However, even though the efforts were so profound no practical solution was found to satisfy the theoretical considerations of the thinkers of the past, and the French motto, Liberté, Egalité Fraternitè, after an initial period of hopes went forgotten in the loft of human’s desires and ideas. Adriano Olivetti, an Italian entrepreneur and politician, tried in the ‘40-50s to transform those theoretical ideas into something more practical and created in Ivrea, Italy, an industrial reality where the economic, social, scientific and cultural worlds were solidly interconnected; and where each worker might have a high level of participation to the life of the activities. This model was successful and led Olivetti’s business to extraordinarily levels of development. However, it did not survive its inventor, when Olivetti died in 1960. Another great thinker and scientist, contemporary of Olivetti, was Reich whose scientific work was instrumental in starting a new era in the understanding of the natural phenomena. And, I do think that with the work of Reich we can really start thinking about a new political, social, scientific, and cultural change, where the theoretical considerations of the many philosophers can now find a practical application. Reich discovered a new type of energy in nature which had life-enhancing properties and that it could be available everywhere. He also found that this energy continuum, which can express as tiny energetic units, is characterized by different phases of existence, i.e., it could be in dynamic, undisturbed flowing condition; in excited and chaotically-moving conditions (called Oranur); or again in deadly and static condition (called DOR). He observed that each of these conditions had particular characteristics. Reich saw that the dynamic units heralded health both in the living and in the environment, the excited units were instead harmful to the living, and the deadly units were even more dangerous and nefarious leading to death of the living and of the environment. However, Reich did find that at a low degree of excitation these energetic units might have therapeutic properties. In addition, the Oranur state at a little higher degree of excitation could produce a motor force thus giving rise to an infinite number of technical applications. It could also transform radioactive matter into a highly-beneficial and life-enhancing matter. Recently, it has been hypothesized that this state can also be instrumental in creating higher states of consciousness. I do believe that the intermediate excited state of these tiny energetic units is of fundamental importance for that change hypothesized by the philosophers, and that can lead us to a new type of world where the French motto may at last find its well-deserved collocation. Like a portal, or an obligatory step to take, after which a new world can be envisaged. However, I do think that this type of world already existed in the past on this planet, as I’m profoundly convinced that the many properties of these tiny energetic units were already known thousand years ago. And, Reich, simply unconsciously and unknowingly, rediscovered this knowledge, developing a science of the ether, in juxtaposition and sharp contrast to the science of the matter, today prevalent. I’m also profoundly convinced that the scientists of the time were much more skilled in managing and utilizing this ether than we are today. I discuss this point in depth in my recent book on the Shamir. I hope that the content of this paper can contribute to peacefully taking the road that leads to that portal, beyond which we might at last find the utopian island or world that has been dramatically and obstinately looked for by so many of the most fervid minds this planet has had. Accordingly, Reich’s latter experiments were focused and aimed at verifying whether very small quantities of radioactive materials, when put inside high concentrations of orgone energy units might be rendered innocuous. The results of the very last experiment he carried out in this direction, called Oranur (4), led him to completely different results and conclusions, and radioactivity was found to be detrimental to high concentrations of orgone energy. Nevertheless, further researches conducted by Reich in the following years, based on the results of the Oranur experience, proved that in the end orgone energy could convert nuclear energy into a more powerful and basically benign form of energy, called Orur (5). Reich started experimenting with radioactive materials and orgone energy concentrations as early as 1939 (6), about 12 years before the Oranur experiment (7). In one of his notes he reported that a vial of radioactive luminescent matter (zinc sulphide), that was kept in a small orgone charger for many years, lost its ionization effect some time later because of the influence of the concentrated orgone energy inside the charger (8). In addition, the zinc sulphide did maintain its luminescent properties, and continued to luminate very strongly. Right before the start of the Oranur experiment, in the period December 15-27, 1950, he performed some continuous measurements with radioactive zinc sulphide and one microgram of radium. He did find that lead shielding with a ¼” thickness did not provide an appreciable reduction of the radioactive zinc sulphide count rate at the Geiger-Muller (GM) counter. On day 7 of this preliminary testing (December 21) he obtained 200 CPM with the radioactive zinc sulphide inside the ¼” lead shielding, and 300 CPM naked at 1 cm distance. However, Reich observed the radioactivity emitted by the material went up when it was put into an orgone energy charger (9). Reich from these preliminary results noted that in some way a nuclear material exposed for some time to concentrated orgone energy units could lose its radioactive potency and observed a variation of its radioactive decay constant. He also noted that lead shielding did not appreciably reduce the radioactivity produced when the same material was unshielded or naked. So, Reich suggested to use in the experiment, in order to produce an Oranur field, freshly obtained radioactive sources, in that only then might they be effective, while a nuclear material which had been exposed to orgone energy concentrations for a long period of time (years) would have none or reduced effects, since it had been already influenced by the concentrated orgone energy units (10). For the Oranur experiment Reich ordered two milligram (mg) of pure radium-226 that were never previously exposed to concentrated orgone energy fields. One mg was used in the experiment and the other one was considered as control (11). A few days before the start of the Oranur experiment Reich measured the background radioactivity in some critical points at Orgonon. On Dec 19, 1950, in the students’ laboratory (12) the radioactivity was 40-50 CPM, and similar values were recorded in other parts of the area (13). The radioactivity was monitored also in the next few days obtaining similar values while, as expected, higher values were recorded in those areas where a mild Oranur reaction was intentionally produced by the small radioactive sources used in the preliminary testing (14). Besides, in order to check the influence of the Oranur field developed during the experiment on living organisms he placed a few hundred mice in the hall of the students’ laboratory, located 40 feet (around 12 meter) far from the external walls of the orgone room (15). 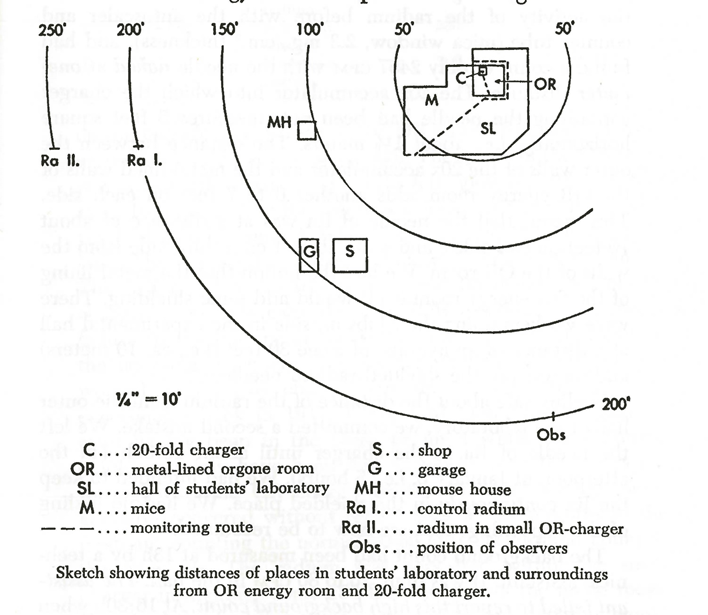 The following figures shows the layout of the facilities involved in the experiment and where the radioactive source was located (marked with C in Figure 1); and the students’ laboratory, where the orgone room was situated (Figure 2). The experiment started on January 5, 1951 at 11.30 AM. The radioactive material, one of the two needles of 1 mg of pure radium-226, was put inside a small charger (a 1-fold orgone accumulator). The charger was then placed inside a 20-fold orgone accumulator located inside the orgone room. Just before the radioactive material was placed inside the orgone room the radioactivity was between 40 and 50 CPM everywhere (18); while in the students’ laboratory varied between 40 and 60 CPM (19). That day the experiment concluded at 4.30 PM. The original intention was to keep the needle of radium-226 continuously in the orgone room, but the sharp increase of the radioactivity in the hall of the students’ laboratory to 70-80 CPM, just after two and a half hours; and to several hundred CPM on the outside of the walls of the orgone room after five hours, forced the decision to amend the protocol and stop the exposure of the radium to the concentrated orgone field inside the orgone room (20). After the removal of the radium-226 needle, the high background counts in the students’ hall decreased to nearly normal value of 60 CPM, after half an hour of ventilation of the facility (21), while in open air outside the laboratory, the count rate was 30-50 CPM. The radium within the small charger was then stored into a garage 150 feet (around 46 meter) away from the metal room. When stored into the garage no variation of the radioactivity was observed in the experimental area (22). According to the results of the first day of experiment, the protocol was amended and the radium-226 inside its charger was then put into the 20-fold orgone accumulator of the orgone room, from January 6 to 11, and taken out after only one hour of exposure. On January 12, the experimental one mg of radium-226 was put into the 20-fold orgone accumulator for only half-an-hour, as the experiment was interrupted. A few minutes after the radium was placed the atmosphere in the students’ laboratory became clouded and shined blue to purple through the glass of the windows (23). The small charger with the radium-226 was taken out of the orgone room and put away to half a mile (around 805 m) distance from the laboratory, within an uninhabited area (24). The reason for the interruption of the experiment was due to the severe reactions of the people to the Oranur field created during the exposure of the radium-226 to the concentrated orgone energy inside the orgone room. They experienced severe belching, severe nausea, sensation of fainting, loss of equilibrium, clouding of consciousness, cramp to the stomach, weakness, and pressure in the forehead (25). No measurement of radioactivity was possible to do soon after the end of the experiment because of the dangerousness of the operation. As a whole after a few months from the conclusion of the experiment, Reich made a list of the typical symptoms people exposed to an Oranur field could experience. Amongst these the most important were severe belching, malaise; nausea; pressure in head, and chest; cramps and twitching in muscles and other organs; hot and cold shivers; fatigue; pathological blood picture; increases of white cells; inflammation of the conjunctivae; dryness of throat; severe thirst; provocation of deadly symptoms; leukemic change in the blood picture; pneumonia; pleurisy; and inner bleedings (26). Of the mice located in the students’ hall, close to the orgone room, 286 in total, 57 died during the experiment, even though the mice were never physically close to the nuclear material; 12 were killed for autopsy and medical purposes; and 217 survived during the experiment but all died in the following weeks (27). Common symptoms the mice developed were immobilization to various degree; rough fur; cold perspiration; total body contraction; cyanotic tail, noses, lips, and ear lobs; severe thirst. Autopsy evidenced a leukemia-like blood picture and a more complex and broader picture of symptoms common to all the mice: pneumonia in the haemorrhagic or organizational stage; a severe fibrous exudate covering the pleural cavity; post-mortal greenish T-discoloration of the subcutis; severely distended veins, including the carotid vein; purple discoloration of the genital organs; grayish or cyanotic, hardened tails; cyanotic ear lobes, toes, and lips; deformed RBC (red blood cell) in the blood of the same shape as those found in leukemic mice, and a high incidence of white cells; highly enlarged spleen, up to four times its normal size; and a striking dryness of the peritoneum, and an apparent deficiency of fluid in the blood system (28). On February 6, 1951, around three weeks after the conclusion of the experiment, radioactivity measurements were done in the student laboratory. It was found a value of 40 CPM both outside and inside, while inside the orgone room, where the experiment was physically performed, it was 30-50 CPM. The small charger containing the shielded radium-226 gave close by 20,000 CPM, while at a distance of 300 cm it was 200-300 CPM (29). The two milligram of radium-226, each one contained in its ½” lead container, were then put inside a 4” concrete and steel wall safe and put in a building at a distance of about 1,200 ft (around 366 meter) from the students’ laboratory (30). This action was taken not because the nuclear sources were dangerous, but to avoid the possibility they could excite the orgone energy of the environment close to the laboratory to such a high degree to produce again a dangerous Oranur field (31). At the end of March 1951, all the orgone devices at Orgonon were dismantled and moved away from the inhabited buildings. This decision was taken because it was impossible to keep assembled or even assemble again any of the orgone accumulators which have been in use before January 5, 1951. They were highly active and drove the background counts from two to four times the usual rate, to 100 CPM and more (32). “4. It is most likely, and even imperative to assume that quite ordinary materials such as rock, metal, and especially material arrangements which have the faculty of accumulating OR energy, continue to be active long after the originally triggering NR has been removed. This resembles induced radioactivity. 5. Structures which are capable of accumulating atmospheric OR energy, such as steel wool, metal filing cabinets or simple metal-lined boxes, become active even if they have not been directly influenced by NR radiation; it is sufficient that they come into contact with a directly affected orgone energy accumulator (36). 9. …….. Buildings which have been freed of any kind of radioactive material, and in addition, from which every single OR energy accumulating device has been removed, still drive the background counts as high as 80 or 100 CPM if regular ventilation is neglected for only half-a-day. On the other hand, fresh air removes the effects and reduces the activity to a normal of around 25 to 40 CPM (37). On April 12 and 13, 1951, Reich monitored again the radioactivity at Orgonon with the GM counter (39). The readings obtained at distances from the 4” concrete/steel wall safe location of 600-700 ft (around 183-213 meter) were 60-80 CPM; while for higher distances the readings were normal, namely 40 CPM (caretaker’s cabin). When he measured the radioactivity at 1 cm from the safe wall (and from 30 cm from the source inside the safe) he found 10,000-20,000 CPM; while at 100 cm he found 600 CPM; and at 1,000 cm it was 100 CPM. Inside the room containing the safe the radioactivity was 6,000 CPM, at 200 cm distance from the safe; and 1,000 CPM on the maid’s room at 300 cm distance from the safe. Reich realized from the high measured values of radioactivity that the safe acted as an energy orgone accumulator, due to its construction characteristics that resembled those of an orgone accumulating device, and hence was producing an Oranur field detectable by the GM counter, of the same kind produced few months earlier in the original experiment. Besides, Reich surmised that an Oranur reaction went on all the while since February due to this arrangement (40). Reich did not know how to manage the situation he was facing. To simply dump the whole safe into a nearby lake did not seem advisable, since the Oranur activity would most likely have affected the water of the lake. To bury it into the ground seemed equally impossible since the orgone energy from the soil would have continued to react (41). The main pioneering job had been done; the main danger signals had been recognized: Oranur phase One and Two; the main symptoms in these intermediary steps were in the open. Behind phase One and Two, there was clearly outlined phase Three, the impotence of NR and the victory of OR energy. Reich decided to open the 4” concrete/steel wall safe and to measure the radioactivity inside it, at a distance of about 40 to 50 cm from the shielded sources situated inside the safe (two mg of radium-226 plus few micrograms of other nuclear material) (45). He obtained more than 100,000 CPM, since the GM counter was not able to measure it as it was out of range. When the nuclear materials were removed from inside the safe the radioactivity inside it decreased to 30-50 CPM. When Reich removed the radium-226 from its shielding and measured immediately the radioactivity, he found that the readings were 30,000-35,000 CPM with the GM counter at 1 cm distance from the naked material (46), and around 3,000 CPM at distance of 100 cm. Since Reich thought that he had achieved his goal with the Oranur experiment, he thus put the nuclear material into a great charger and then again into a 20-fold orgone accumulator for about two days. However, he had to take it out again because of the formation of a new severe Oranur reaction (47). He measured the radioactivity and he found 2,000 CPM outside the charger. The development of physical Oranur symptoms, such as heavy air, and malaise, nausea, and pressure in the people was felt. Symptoms that were not felt when the nuclear material was inside the safe, as a consequence of the strong shielding effect of the steel/concrete thickness, that was not available instead when using only the charger, being made of a thin layer of steel, plus a thin layer of organic material that was not enough to shield the ionizing radiations. This latter arrangement allowed the ionizing effect of the nuclear material to irritate and trigger orgone, and convert it into DOR action. Reich concluded that to reduce the DOR effect one had to put the nuclear material into heavy shielding and thus confined, into the charger. In this way, the orgone energy units would get at the nuclear material, but not the opposite, the nuclear material could not get at the orgone energy units. In order to have a (controlled) Oranur reaction Reich suggested to build a housing for the safe and to put the nuclear material into the safe and then to put the safe (containing the nuclear material) in the vicinity of the charger. In this way, the Oranur effect was secured without having the possibility of the development of a DOR field (48). It should be highlighted here that the extension of the Oranur field of 600 ft was due to the reaction of the orgone energy units in the environment surrounding the 4” steel/cement safe to the presence of the shielded nuclear sources located inside. From the above data it can be observed the naked radium-226 gave around one third of the radioactivity emitted when it was confined in its lead shielding. In order to compare the above measured data, one mg of the same radium-226 that was never exposed to concentrated orgone energy fields, was ordered from New York. Before being sent it gave circa 16,000 CPM naked, and 7,000 CPM within a ½” lead shielding; while soon after arriving at Orgonon it gave circa 300,000 CPM shielded (measured by the Tracerlab autoscaler). According to the above considerations, it is reasonable to think that the radium-226 was put inside the great charger naked, since a radioactivity of 2,000 CPM was measured outside the charger. Indeed, in case the radium-226 was put inside the great charger shielded a much higher value had to be measured, having found on the naked sample around 3,000 CPM at distance of 100 cm few days earlier, on April 15. “In the mechanistic technician of physics, the observation of the physical functions of nature split off from the emotional manifestation as “physics” here and “mysticism” or “religiousness” there. On the other hand, in the well-trained orgonomic observer, these two modes of experiencing nature, otherwise so much opposed to each other, are united into one single picture. …. The sharp boundary lines between physics and what is called “metaphysics” have broken down. The metaphysical intuition had a physical basis: “GOD” and “ETHER” are ONE (53). All boundaries between science and religion, science and art, objective and subjective, quantity and quality, physics and psychology, astronomy and religion, god and ether, are irrevocably breaking down, being replaced by a conception of the basic unity, a basic CFP of all nature which branches out into the various kinds of human experience (54). One of the aims of the present study is to understand whether the Oranur field, created during the original experiment, was produced by the radium-226 taken inside the small charger either naked or shielded by its ½” leaden tube. Besides, whether the specific biological reactions developed by the bio-energetic systems present at Orgonon during the experiment had some connection with the ionizing radiations transmitted through the orgone devices and the orgone room to different directions is also investigated. In calculating the amount of energy coming from the radioactive source and then absorbed by the tissues of the living organisms, a number of factors were considered. The most important of these are the proximity of the living organisms to the radioactive source, the obstacles the radiations had to pass through to reach them, and the exposure time. Many authors, including Reich’s close collaborators, discussed the point. Some of them reported that the one-mg needle of radium-226 was shielded, while some others simply stated the one-mg needle was put inside the charger (probably without shielding). An exhaustive overview of the related literature has been done elsewhere and the reader may refer to it for more details (58). In this study, particular attention has been given to what might have occurred during the original experiment above all along two main directions of propagation of the ionizing radiations (Figure 3). The study of the trend of the radiations attenuation from the small charger, where the radium-226 was contained, towards the mice cage (marked as M on direction A in Figure 3) aims to check whether the intensity of the ionizing rays (whether any) had some influence on the biological reactions and diseases the mice developed during the experiment and whether the subsequent deaths were correlated. 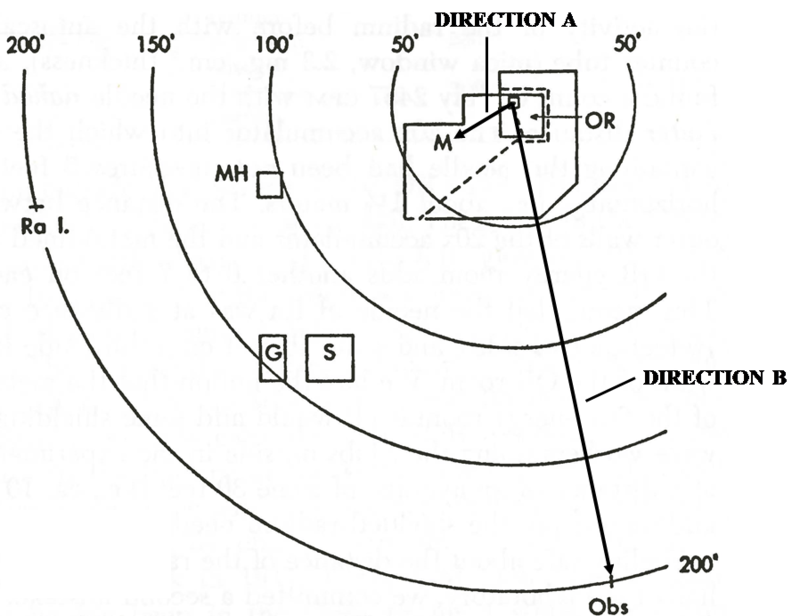 Similarly, the evaluation of the intensity of the gamma rays hitting the observers outside the students’ laboratory (marked as Obs on direction B in Figure 3) aims to determine whether the symptoms Reich and his collaborators which developed during the whole experiment, might be associated to the ionizing radiations that travelled along that direction and reached the observation site. The ionizing radiations radium-226 emits are alpha particles (59), with a maximum energy of 4,785 keV, and gamma-rays, with a maximum energy of 186 keV. Alpha particles have a mass and an associated electrical charge, and are characterized by very short pathlengths. The average distance a 4 MeV (60) alpha particle travels in air before coming to rest is about 3 cm, while the same energy can be stopped by a thin piece of paper, or a thin sheet of some other solid or liquid materials. Where I is the emerging intensity transmitted by the absorber of thickness L, Io is the incident intensity of the gamma-ray on the same absorber, B is the build-up factor (62), and ml is the linear attenuation coefficient (expressed in cm-1). The ratio I/Io is called the gamma-ray transmission. The linear attenuation coefficient ml depends on the gamma-ray energy, the atomic number (Z) and the density (r) of the absorber material (63). The mass attenuation coefficient is independent of the density, and it is more commonly tabulated than the linear attenuation coefficient. The measurement units of the mass attenuation coefficient are cm2/g. For energies between about 0.75 and 5 MeV, almost all materials have, on a mass basis, about the same gamma radiation attenuation properties. To a first approximation therefore, shielding properties are approximately proportional to the density of the shielding material. Radiations could be reduced using barriers consisting of metals or materials that have the ability to either absorb the radiations and convert them to heat or reflect them. The half-value layer (HVL) is the thickness of absorbing material required to reduce the incident radiation intensity by a factor of two, and that will halve the gamma-ray intensity passing through it. The HVL is measured in cm, and decreases as the atomic number Z of the absorber increases. For all the materials the HVL increases with the energy of the gamma-rays. By adding one or more halving thickness of the same material the intensity of the gamma rays is further reduced according to the number of halving layers added. This value is called protection factor (PF), and tells how much of the intensity of the incident gamma-ray radiation is transmitted and hits a specific target downstream of the absorber whole thickness. To this extent the PF characterizes the radiation shield of a gamma-ray incident on an absorber. In case of only one halving layer the PF is two; while if one has 4 halving layers, the PF is 16. In case the thickness of the absorber is made of 10 halving layers the PF is 1,000 and is a shield that only lets about 1/1000 of the gamma-rays radiations pass through. Generally, the expression of the PF is given by 2n, where n is the number of halving layers (65). Absorbers can be also made of different materials, each characterized by a different HVL value. In this case the total PF is given by an equivalent value determined by the individual contribution of each material. FEMA (66) establishes that the minimum value of PF for a shelter in order a human organism can be protected by a nuclear fallout is 40. However, PF of 200 and more is recommended. The modern-day standard for PF is 1,000. 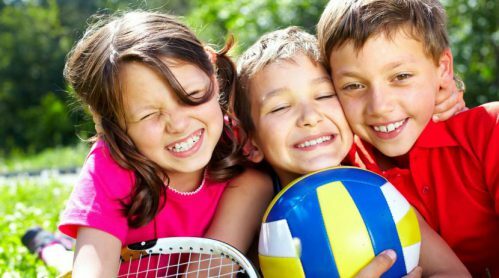 However, the risk for the health of a person is not only dependent on the radiation hitting the person, but is also a function of the exposure time. Indeed, radiation is less dangerous in the case that the time spent by the person beside the radiation source is reduced. According to the recommendations of international councils such as ICRP (67) and USNRC (68), the maximum exposure limit or effective dose (69) allowed to a person who works with ionizing radiations is 50 mSv/yr (milliSievert per year). This value however must not exceed 100 mSv for a set of 5 consecutive years. For the general public the limit is set to 1 mSv/year that is considered as a low or very low radiation dose. This value corresponds to an average allowed exposure limit per hour of 0.11 mSv (microSievert). In case of a dose received by the whole body during one short and intense irradiation, UNSCEAR (70) has established a way of classifying exposure levels based on the thresholds above which deterministic effects, i.e. short-term biological signs or post-radiation symptoms, occur and that are felt by all individuals exposed above these thresholds. Effective doses below 200 mSv are considered to be low or weak, and below 20 mSv very low or very weak. Radiation absorbed in a medical context (excluding radiotherapy) as well as those occurring from natural sources fall into this category. Doses in this range are characterized by a lack of deterministic effects (71). The specific activity (72) of radium-226 is given by 36.6 GBq/g (or 1 Ci/g) (73); while the dose rate for a gamma emitter point source is given by 1743.7 mSv/h/GBq and 17.43 mSv/h/GBq at a distance of 1 cm and 10 cm, respectively. Being the quantity of radium-226 used by Reich in the Oranur experiment of 1 mg, the activity was 0.0366 GBq (or 1 mCi), and the corresponding dose rate at 1 cm and 10 cm is given by 63.8 mSv/h and 0.638 mSv/h, respectively. In order to determine the transmitted intensity of the gamma-rays emitted by the radium-226 during the Oranur experiment at Orgonon, in January 1951, we need to know the arrangement in the premises of the orgone apparatus involved in the experiment and the materials they were made of. The structures and the devices involved in the experiment are here below described and discussed. For each of them, it is also reported, when available, the sizes and the materials they were made of. Each layer of the materials used in the construction of the structures may be considered as an individual barrier to the propagation of the gamma rays emitted by the radium-226 situated in the small charger. As alpha particles are characterized by very short pathlengths, they are not considered in the present study as potential noxious energies in that they were totally blocked inside the small charger in which the radium-226 was contained and never reached the living systems present during the experiment. On the contrary gamma rays, being characterized by much higher pathlengths are instead considered and the possible effects on the bio-energetic systems evaluated. A leaden tube. The needle of radium-226 from time to time was kept inside a leaden protective tube of ½” thickness (74). After the conclusion of the Oranur experiment the shielded needle was put inside a 4” wall safe made of steel and cement with the aim to protect the surrounding environment from the diffusion of an Oranur field produced by the radioactive source (75). A small charger. The charger was a 1-fold ORAC (76). It contained the one mg of radium-226 during the Oranur experiment. No information about the size and the materials it was made of were reported by Reich. It can be assumed that it had characteristics similar to those of a small charger which Reich mentions, beginning in February 1951, few weeks after the conclusion of the experiment. The latter was one cubic foot in volume, and was internally lined by a metal sheet gauge 26 (77). As to the intermediate layer we may presume it was made of a plastic sheet (PET, supposed to be 1 mm thick) alternated to steel wool (about ½” or 12.7 mm thick). A compressed wood fibre board would have served as outer layer (½” or 12.7 mm thick) (78). A 20-fold ORAC. It housed the small charger during the Oranur experiment. The ORAC was 5 feet square horizontally (1.524 m) (79). No information has been reported about the height. As to the materials it was made of, it may be supposed Reich used an (galvanized) iron sheet (gauge 28, or 0.397 mm thick) as inner layer; and a compressed wood fibre board, as outer layer (½” or 12.7 mm thick). As to the materials of the intermediate layers, it may be assumed Reich used plastic sheet (PET, supposed to be 1 mm thick) alternated to steel wool (about ½” or 12.7 mm thick). The orgone room. It housed the 20-fold orgone accumulator during the Oranur experiment. The size of the orgone room was 18 ft x 18 ft (or 5.486 m x 5.486 m) (80). No information was reported by Reich about the height of the room, but is can be supposed it was about 2.2 m (deduced from the picture of the orgone room, not reported in this article). It was lined internally by an iron sheet (gauge 26 or 0.476 mm) (81); while the internal organic layer was glass fiber (½” or 12.7 mm thick) (82). It may be considered the walls of the room built by ordinary bricks (assumed to be 12.5 cm thick), while it was lined externally by a cement board (about 1 cm thick) (83). The Students laboratory. It contained the orgone room. The size was 60 ft x 70 ft (or 18.29 x 21.34 m) (84). The walls of the laboratory were made of wood (85). However, what is important to the present study is the windows of the laboratory that were the weakest point in terms of gamma-ray propagation outside it, and through which the observers saw the formation and the propagation of the blue-purple cloud in the laboratory hall during the last day of the Oranur experiment. The windows are made of glass, single paned, around 5 mm thick. Sizes of the large windows might be deduced from figure 2. Dimensions can be assumed to be around 3.7 x 2.2 m.
Mice cage. It housed the mice that were exposed to the Oranur field during the experiment. It was located 48.5-49.5 ft (14.8-15.1 m) away from the radioactive source (86). No info is reported about the sizes and the materials the container was made of. It may be assumed it was a cage wire mesh. The following figure 4 shows the arrangement of the radium-226, of the small charger, and of the 20-fold ORAC inside the orgone room. The following table 1 summarizes the sizes (when available) of the devices and structures above discussed, and the materials and corresponding thicknesses they were consisting of. Table 2 reports the distance between the different devices involved in the experiment. Table 3 shows the mass attenuation coefficient, the density, and the corresponding half-value layer (HVL) of the materials the devices and structures involved in the Oranur experiment were made of for a gamma-ray incident intensity of 0.2 MeV (when not otherwise specified). Air is included in table 3 being the attenuation of gamma-ray radiations occurring during the experiment also through it. The one-mg of radium-226 was unshielded and put inside the small charger naked. In the calculations it has been considered for simplicity a value of the build-up factor B in eq. (2) of 1. This has been done as the type of shielding configuration, the type of materials, and the related thicknesses provided a very small increase of the transmitted dose rate. The only material that would have been given a little higher increase in the transmitted radiation intensity is lead with a value of the build-up factor about 1.06. However, this value does not change the order of magnitude of the transmitted dose rates at the two investigated end points, M and Obs, thus making the simplification much more than acceptable. The total effective dose, the living organisms were subjected to during the whole Oranur experiment, has been determined according to the total exposure time or the total duration of the experiment that was 11 ½ hours, distributed as follows: Jan 5, 1951 = 5 hours (11.30-16.30); Jan 6=1 hour; Jan 7=1 hour; Jan 8=1 hour; Jan 9=1 hour; Jan 10=1 hour; Jan 11=1 hour; Jan 12= ½ hour (91). 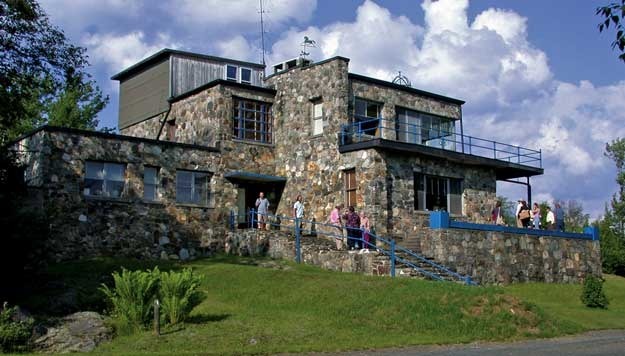 At the Observers site (end point Obs) the transmitted intensity of the ionizing radiations was 3.8·10-5/1000 of the original intensity emitted by the shielded radium-226. This means that Reich and his collaborators were exposed during the whole experiment to a gamma-ray intensity of about 2.4·10-3 mSv/h. A quite low value, with a corresponding PF of about 2.6·107 that is an extremely high value when compared to the maximum standard suggested today (Protection Factor, PF, of 1,000). The total effective dose Reich and the observers were subjected to during the whole experiment was about 2.8·10-2 mSv. At the mice cage (end point M) the transmitted intensity of the ionizing radiations was 8.7·10-5/1000 of the original intensity emitted by the shielded radium-226. This means that the mice, kept constantly in the cage for all the duration of the experiment, were exposed to a gamma-ray intensity of about 5.5·10-3 mSv/h, which corresponds to a PF of about 1.1·107. The total effective dose the mice were subjected to during the whole experiment was about 6.4·10-2 mSv. The above values are by far lower than those imposed by the regulations and tell that practically the site, where the mice were constantly kept, should not have been affected by any radiations coming from the shielded radium-226 in the small charger. At the Observers site (end point Obs) the transmitted intensity of the ionizing radiations was 3.0/1000 of the original intensity emitted by the unshielded radium-226. This means that Reich and his collaborators were exposed during the experiment to a gamma-ray intensity of about 1.9 mSv/h. This value is little higher than the hourly exposure dose limit set at 0.11 mSv/h, and corresponds to a PF of about 333 that is a little below the maximum standard value suggested today (PF of 1,000). The total effective dose, the observers were subjected to during the whole experiment, was about 22.0 mSv. At the mice cage (end point M) the transmitted intensity of the ionizing radiations was 6.8/1000 of the original intensity emitted by the unshielded radium-226. This means that the mice, kept constantly on that site for all the duration of the experiment, were exposed to a gamma-ray intensity of about 4.3 mSv/h, which corresponds to a PF of about 147. The total effective dose, the mice were subjected to during the whole experiment, was about 50.0 mSv. The above values are little higher than those registered at the observation site, but however, are still very low. Indeed, if we consider the total effective dose the mice were exposed to, this value is by far lower than 20 mSv (or 20,000 mSv) which is considered by UNSCEAR a very low or very weak dose for a short duration exposure. Below this dose deterministic effects, such as short-term biological signs or post-radiation symptoms, are practically absent. Table 4 below summarizes all the above calculated data. As a consequence, we are witnessing a controversial picture, where many people experienced during the Oranur experiment biological reactions typical from exposure to a medium effective dose; and where the mice (apart those killed for scientific purposes) had reactions (and about 20% of them died) typical from exposure to very high effective doses. But at the same time, according to the calculations, no effective doses like those set by the regulations would ever be detected at the sites where the two bio-energetic systems (mice in M, and humans in Obs) were situated. Besides, during the whole experiment very high values of the radioactivity were recorded outside the orgone room, in the students’ hall, and in the environment outside the laboratory. Before the start of the experiment the radioactivity in the hall of the students’ laboratory was 40-50 CPM, while during the experiment values of 70-80 CPM were measured. Besides, on the outside of the walls of the orgone room several hundred CPM were detected. After the conclusion of the daily experimentation, i.e. when the radium (inside the small charger) was removed from the inside the 20-fold orgone accumulator and stored in a garage 150 feet away from the experimental site, the radioactivity dropped to 60 CPM first, and then to 30-50 CPM after airing of the premises. No data could be instead measured by the Geiger-Muller counter inside the orgone room during the whole experiment in that the device jammed when approaching the 20-fold ORAC because of the high radioactive activity. Again, we are witnessing a controversial situation, in which the radium-226 ionizing activity was well screened by the materials, the structures and the orgone devices were made of, in such a way not to justify the high increase of the radioactivity readings observed during the experiment. Values that then dropped to standard values typical of the background when the radium-226 was removed from its experimental location inside the 20-fold ORAC. In addition to the above, we must also consider the formation of the blue-purple cloud in the students’ hall. Even in this case, according to the calculated values of the effective doses reported in table 4, no particular intensity could be ascribed to the gamma-ray radiations in the students’ hall for the development of a cloud of such characteristics. As a whole and as absurdly as it could be, according to the competent authorities in the radiological fields nothing should have occurred in such experimental conditions. A conclusion that cannot at all explain the phenomena observed during the Oranur experiment. And this is above all because presently our scientific approach to the study of the natural physical phenomena is based on the Einsteinian view of the Universe. It envisages that our atmosphere is devoid of any kind of energy particles thus negating the possibility of the formation of a noxious and killing field, and of all the related phenomena from an extremely low amount of radioactive source, such as the one-mg of radium-226 could be, and furthermore in the worst scenario shielded by several layers of absorbing materials. A behaviour that might highlight Einstein’s uncertainty on what he had developed, or maybe the awareness of the limitation of the theories he had conceived, be it the special theory of relativity or the theory on Brownian motion, since he had become aware of their weaknesses or limitations on being applied (94). The following figure 5 shows the difference between the physical model of the space, and specifically, of the atmosphere, according to Einstein, and to Reich. From the figure it can be seen the model conceived by Einstein envisages the presence of air as unique component. The atmosphere is filled with the gases typical of the air, such as nitrogen, oxygen, argon, and other minor components but, for Einstein, no other energy of whatever kind is filling the atmosphere (95). Reich hypothesized instead that, in addition to the above components, an energy is filling the atmosphere, and all the universe, too, in such a way to form a continuum. He found that this energy continuum was consisting of tiny units with distinct properties, and governed by specific laws. Under the influence of these physical parameters the free-flowing, undisturbed units start changing their paths, and moving in an unpredictable way. 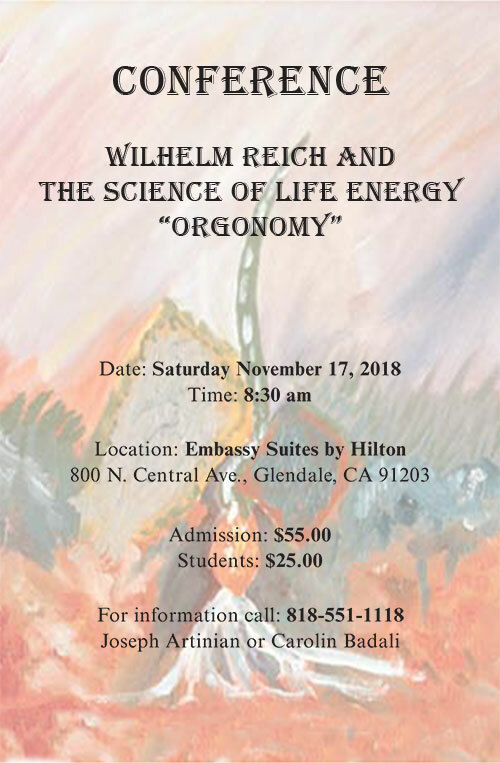 In parallel they observe a decrease of the life-enhancing properties they possess until they lose all the positive qualities and transform themselves in static, deadly, and life-negating units that Reich called deadly orgone energy (DOR) (97). This latter phenomenon occurs when the activating agents continue their excitation activity on the units for a period long enough to devoid them of all the dynamicity they possess. From this point on the units behave like deadly aggregates affecting the environment in which they form and creating a block to the movement of further dynamic units that are trying to flow through. In these conditions the living in the area are subjected to these blocks and start to die, be it inside a bio-energetic system or in the atmosphere. This gives rise either to diseases or desert-like conditions, respectively. The phenomenon however is reversible and, by appropriate conditions and processes, the DOR can be converted back again to dynamic, flowing, and life-enhancing orgone units (98). 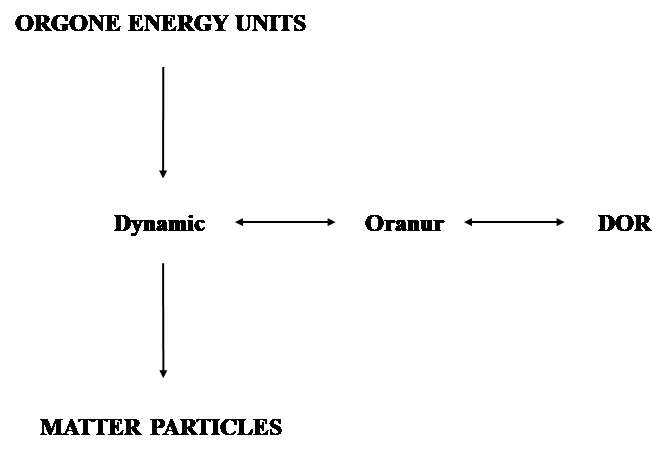 Figure 6 shows the different phases of the orgone units, and the hierarchic sequence from energetic units to matter units or particles. The following figure 7 correlates the concentration of orgone energy units available in nature against the degree of excitation of the same units. In the graph a zero excitation degree (x-axis) corresponds to units freely and dynamically flowing undisturbed into the atmosphere or into living organisms; while an excitation degree of 100% corresponds to deadly and static units, that had lost all their movements. According to Einstein’s view, being no energetic units filling the universe, the possibility to excite these units is nil. As a consequence, Einstein’s view of the Universe can be represented on the graph by the origins of the two axes (marked as B in figure 7). According to Reich, being that all the Universe and our planet is filled by energetic units that can be subjected to a different degree of excitation, we might find the condition for any natural concentration of orgone units to be higher than zero (that is marked as A in figure 7). This situation corresponds to a variety of physical and biological phenomena that Reich studied and accurately discussed and reported in his books. For example, the formation of matter as well as heathy conditions in living organisms and in the environment may intervene for the dynamic and undisturbed flow conditions of the orgone units. The development of diseases in the living, as well as the occurrence of drought and aridity in the environment, may occur for a low to high degree of excitation of the orgone units. Meanwhile, death of the living in organisms (tumour, etc.) as well as desert-like conditions in the environment may intervene for extremely high excitation of the orgone units (that in this stage might have lost all their dynamicity and have transformed themselves into a static accumulation of deadly units or DOR). However, according to Reich the concentration of these orgone units can be artificially increased by using particular devices he called orgone accumulators. In this orgone-rich environment (marked as C in figure 7) the orgone units can be excited to a various degree (from nearly 0 to as high as 100) by amounts of the activating agent smaller than those required in standard conditions. 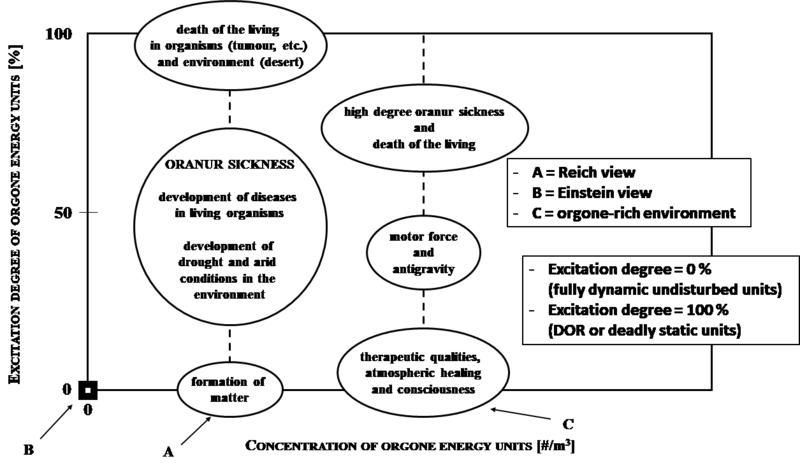 Reich observed that in these operational conditions the excited orgone units might be characterized by the following functions: 1) therapeutic qualities, atmospheric healing and perhaps higher state of consciousness (100) at zero or very low degree of excitation; 2) motor force, and antigravity, at low to medium degree of excitation; and 3) Oranur sickness and death of the living for medium to high degree of excitation. 4. ….. R. has written a complete report on the 1st Oranur experiment which he now plans to send to the AEC. He is particularly thrilled with the thought that the action of the atomic bomb may now be comprehensible and that the nature of disease in general may have been really approached. His work hypothesis is that in both cases it is the OE that is affected by the trigger action of in one case nuclear radiation and in the other whatever the particular noxae may be. R. said on March 20th when he re-read the law, that legally he has a death penalty over his head, since the law states that anyone who works with nuclear radiation to create nuclear fission without the permission of the AEC is subject to the death penalty. And, he has, he says created fission through NR during the first OR experiment. He did not set out to do that, and he has created fission in a quite different sense than the AEC understands that term, but the emotional plague out to get him might not take into account such considerations. He is forced to submit the report on the experiment to the AEC before he can publish it, to safeguard himself legally. But that involves its dangers, too: The AEC could use the results in their own fashion which might be in conflict with R.’s intention not to reveal a deadly quality of OE, and (2) the AEC did not witness the experiment and does not understand the methodological background and the physical findings against which the experiment was made and in the light of which it must be examined. At the same time he cannot not report on the findings nor publish them without the AEC’s permission. He cannot keep what has happened a secret, even if he wished to, and to keep it a secret would kill off the possible great immunization and other medical benefits to be derived from it. He must take into consideration the use of ORANUR destructively by the Russians who, with their own particular kind of cleverness, might make quicker use of it than the US. Added to these great complications, he would like to substantiate his findings with further experimentation but cannot know how to proceed without endangering the workers and possibly the population. Yet he cannot expect anyone else to carry it on since no one else has the knowledge and the background to proceed intelligently with it. 2. The response of the orgone energy increases with the number of times the disturbing “radiation” is presented. This increase takes place in a functional, non-mechanical manner, the details of which in both the physical and emotional realm remaining still to be elaborated. a. Physical realm: The observers felt the response of OE to NR hardly at all the first day the radium was brought in the lab, more on each day, until the reaction became so severe that the experiment was temporarily halted. 3. Aroused orgone energy – in both the physical and emotional realms hits other energy systems in their weak spot(s). “On the other hand, when NR material was not sufficiently shielded, it had an even chance to irritate and trigger OR energy into DOR action. …. Now it seemed clear that in order to reduce the DOR effect, one had to put the NR material into heavy shielding and thus confined, into the charger, OR would get at NR, but not NR at OR. We decided right away to build a housing for the safe to put the NR material into the safe again and to put the safe, containing NR, in the vicinity of the charger. This would secure the Oranur effect without the DOR element if we were on the right track of reasoning. The following figure 8 is representing a scheme of the above suggested layout, where the radioactive material is put, shielded by its ½” leaden tube, inside the 4” steel and concrete walls safe. In turn, the safe is put close to a one-fold small charger, and both are situated inside a housing. Reich did not specify the architectural design of the latter but it is reasonable to think that it had not the characteristic of an orgone accumulating device. Such arrangement would have had the function of preventing the nuclear source transmitting the radiations outside the safe, thus avoiding the possibility to create an unwanted and uncontrolled excited orgone field in the surrounds of the triggering unit (safe and small charger) that could be directly excited by the photons emitted by the source ad transmitted outside the container. At the same time the orgone energy units concentrated inside the leaden tube and the safe could be excited by the action of the radiations of the nuclear source, and hence form the core required to start the Oranur reaction. Once the reaction was produced it could be transmitted outside the safe to the nearby orgone units with a chain-like propagation. To my best knowledge Reich never carried out such second Oranur experimentation. Southgate recently replicated the Reich’s Oranur experiment by using a very small amount of radioactive material (106). He used 0.26 mg of americium-241 that corresponds to an activity of 0.9 mCi (or 33.3 kBq), a value about 1,100 times less than that used by Reich in the original experiment (about 36.6 MBq or 1 mCi) (107). The americium-241, kept in its original plastic case, was put for some weeks either inside a powerful orgone cabinet, where many smaller orgone apparatus were present, or around it at different distances. He monitored the behaviour of the Oranur field, by radioactivity measurements with a Geiger-Muller counter, and of the orgone field by a Life Energy meter. He found the formation of an Oranur field all around the orgone cabinet with an extension of at least 18-24 ft (5.5-7.3 m) substantiated by a parallel increase of the radioactivity and orgone field readings (108). He also observed a direct relationship between the Oranur field and the intensity of the orgone field, in that higher concentrations of orgone energy units, when subjected to the action of the radioactive source, were accompanied by higher values of the radioactivity. Southgate observed also that the Oranur conditions persisted even after the removal of the americium-241 at the end of the experiment and that the cabinet and the orgone devices, contained inside the cabinet, maintained its Oranur charge for much longer periods. At this point it is more than reasonable to hypothesize that in Reich’s original Oranur experiment the increase of the radioactivity readings; the biological reactions Reich and the observers, and the experimental mice experienced; the deaths of part of the experimental mice; and the formation of the blue-purple cloud in the students’ laboratory, were all the consequence of the Oranur field originated from inside the charger and triggered by the radioactive activity of the small amount of radium-226. And all the above reactions were not the results of the ionizing radiations of the gamma-rays in those areas, in that the intensity transmitted through all the materials, the 20-fold ORAC, the orgone room, and the students’ laboratory building were made of, was so low in magnitude to be considered safe and without consequences to the health of the living organisms. It is evident that the only function the one-mg of radium-226 had, was to trigger and create a chaotic movement of the orgone units available in the closeness of the radioactive source. It can be presumed that all the orgone units inside the small charger were excited to a very high degree by the activity of the radioactive source thus producing an uncontrolled, mad or amok, according to Reich’s wording, movements. However, it is well known that no phenomena like those observed and listed above can be produced by one-mg of radium-226 in standard conditions, namely when the concentration of orgone units is not increased by any accumulating orgone devices and is the one typical of the natural background in the atmosphere. This condition corresponds to the point along the vertical line A in figure 7 for a zero degree of excitation. In this case a tiny amount of radioactive material does excite the orgone units, but these units are available in the atmosphere in low or very low concentrations thus making not possible to reach a critical core of excited units that can be transmitted to nearby units, in a chain-like reaction. Indeed, it should be highlighted that the excitation is a typical consequence anytime the orgone units come into contact with a radioactive source, but a reaction can occur and be transmitted only in the case the concentration of the orgone units in the environment, in which the radioactive material is located, is high enough for the excited orgone units to reach a critical conditions through which the uncontrolled, and chaotic movements are transmitted in the space to nearby units thus triggering a chain-like reaction until to the point when the excited units have a less-than-critical value no longer enough to further transmit the excitation to nearby units. At this point the Oranur reaction and the associated field gradually vanishes. As it is well known, the easiest way to obtain very high artificial concentration of orgone units is to resort to orgone-accumulating devices such as those used by Reich at Orgonon. By these devices the concentration of units in the inside is much higher than that in standard environmental conditions. 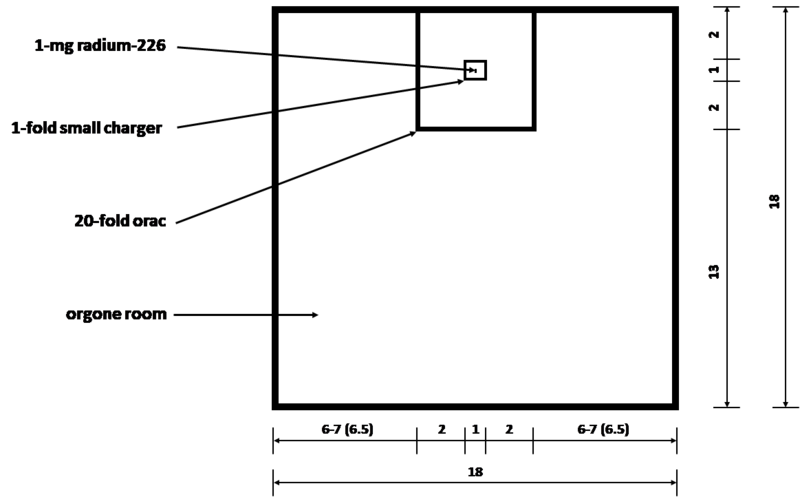 When the concentration of orgone units in the environment is close to standard, background values (vertical line A in figure 7), the excitation of the orgone units by a tiny amount of a radioactive source is low and not enough to start an Oranur reaction, even though the units in the closeness of the triggering source are somewhat excited but to a lower degree than needed to trigger a chain-like reaction. However, the development of a high Oranur field does occur also at standard concentrations provided that an extraordinarily high amount of radioactive source is used as in the case of an atomic bombing explosion. According to the above, the extension of the Oranur field is thus function of the concentration of orgone units in the environment, of the amount of activating material, i.e., the radioactive source, and of the exposure time, or in other words the triggering effects of the radioactive material might be function of the total effective dose the orgone units are exposed to. Hence, it can be postulated the degree of excitation of the orgone energy units is function of the amount and of the intensity of the alpha, and beta particles; and of the X-rays, and gamma rays emitted by the radioactive source. And, the maximum excitation should occur inside the environment where the shielded radioactive source is contained. In case of the presence of ionizing radiations downstream of a set of absorber materials (when a radioactive source is unshielded or not properly shielded), they are triggering different nuclei of highly excited orgone units that in turn are creating an additional and overlapping effect to the primary one with an unpredictable intensification of the Oranur reaction and effects. Hence, it can be inferred that the maximum excitation of the orgone units, were subjected during the Oranur experiment at Orgonon, might have occurred either inside the leaden tube (in case the one-mg of radium-226 was shielded) or inside the small charger (whether put naked). After the orgone units started to be excited by the alpha particles and gamma rays of the radium-226, the excitation was transmitted to the nearby orgone units outside the small charger, as if the dynamic, undulatory movement of the orgone units was in some way affected and changed by the excitation of the first units. In this way dynamic orgone units were changed into Oranur orgone units even though in an area where no ionizing radiations were available, or available with a small intensity. And once the Oranur effects took place, it travelled through the air as if infesting, chain-like, one area after another. At Orgonon, such infestation has been found as far away as two miles from the place of the original effect (110). This phenomenon developed also, during the research carried out by Southgate even though to a much lesser extent. He found that the propagation of the excitation of the Oranur units extended to at least 18-24 ft. Besides, Reich found that also materials such as rocks, metals and especially material arrangements which had the faculty of accumulating orgone energy, continued to be active long after the originally triggering radioactive material has been removed. This peculiarity was confirmed also by Southgate. If we assume that the concentrations of orgone units in the two orgone set-ups in Reich’s and Southgate’s experiment might be of the same order, the extension of the Oranur field might be considered directly proportional to the total effective dose released during each experiment. A value that is 733.9/1.11 = 661.2 times lower than the one that characterized the original Oranur field at Orgonon. According to the above the extension should have been 3218.7/661.2 = 4.87 m or 16.0 ft. A value that is very close to the range of 18-24 ft experimentally determined by Southgate in his measurements. Besides, being the americium-241 used in the experiment contained in its PVC plastic casing (2-3 mm thickness), the intensity of the ionizing radiations transmitted outside it was about 87% (111). That means the radiations emitted by the amerciunm-241 were only partially shielded by the PVC case during the whole experiment. At this point, being the total effective doses delivered in the two above experiments and the related Oranur field extensions quite comparable, and considering also the fact the americium-241 was only partially shielded by its plastic container, we can argue that the one-mg radium-226 in the original Oranur experiment was put inside its charger unshielded, or not protected by its ½” leaden tube. And this adds and strengthen the results of the literature review where it does seem Reich put the radium-226 source inside the small charger naked. This might explain the development of the toxic and nefarious Oranur field even if the radium-226 was kept inside the orgone room for a total of 11.5 hours only. If the above considerations hold true, with all the assumptions and approximations introduced, it might be argued that a radioactive source activity of 1 Ci (corresponding to 1 g of radium-226) put naked in a similar orgone set-up might infest an area with an extension of more than 3,000 km. Besides, we may assume the movement of the Oranur reaction is occurring not only horizontally but also in all the other directions, and hence the spreading of a similar reaction might occur with a sphere-like path with a radius of at least 3,000 km. According to the above hypothesis an Oranur reaction and the associated Oranur field can propagate into the atmosphere to a distance as high as to reach a good part of the thermosphere (112). Besides, the propagation of the reaction in the underground may similarly reach extraordinarily deep depths that, however, cannot be estimated being the propagation of such reaction inside the mantle’s formations (lithosphere, asthenosphere, etc. ), that are characterized by different densities and states, not known. A recent case that might be the consequence of an Oranur reaction might be the short-term radioactive contamination of the atmosphere by ruthenium-106 (113) that had been detected in many European countries in the period from the end of September to mid-October 2017 (114). The presence of the radioactive element was observed in the atmosphere of 31 countries of the European continent at levels ranging from a few mBq/m3 to more than 140 mBq/m3. The concentration levels detected in the air in Europe were however of no consequence for human health and for the environment. The first observations were made in Russia on September 23 at Kyshtym, on September 25 at Argayash and on September 26 at Bugulma and other nearby monitoring stations. All the above stations were located in the south of Urals. It was observed that the detection of ruthenium-106 was also accompanied, in some European stations (Sweden, Czech Republic, and Austria) by the detection of ruthenium-103 (115), with a ratio ruthenium-106/ruthenium-103 of about 4,000. IRSN carried out a study in order to determine the possible location of the source, to assess the total activity released and the release duration, and to understand the process that might be at the origin of the release of ruthenium-106 (116). Based on meteorological conditions and the measurement results available in the European countries a simulation to estimate the above parameters, i.e. release zone, the quantity of ruthenium-106 released, and the period and the duration of the release was carried out by IRSN. 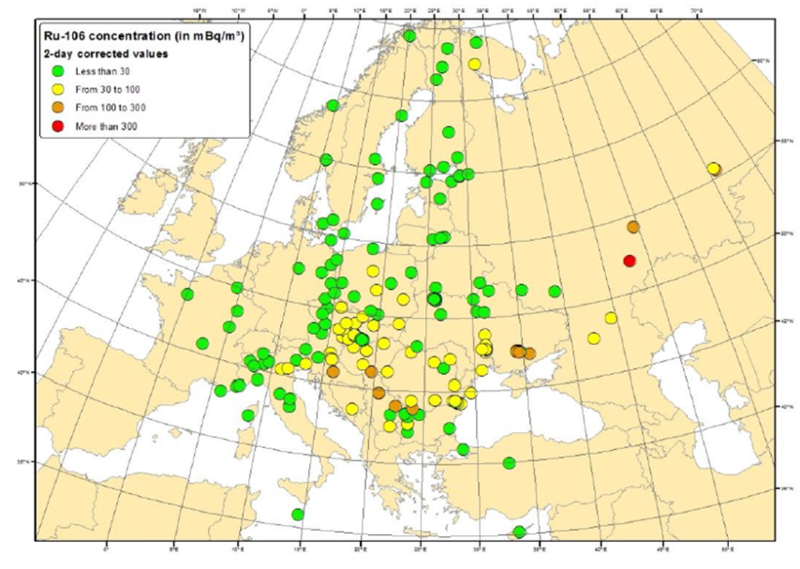 They came to the conclusion that a terrestrial release emitted from the regions located between Volga and Ural might explain the contamination of the atmosphere detected in Europe. The activity of ruthenium-106 released was estimated to range between 100 and 300 TBq. The release would have occurred between September 25 and September 28, with a duration of no more than 24 hours. In doing an evaluation of the type of event that might have led to the large atmospheric contamination the following were considered to be involved: 1) a nuclear reactor involving irradiated fuels or targets; 2) operations on targets used in the production of sources, for instance in the medical field (activity of the order of MBq); 3) source of ruthenium-106 used in the medical field; 4) source of ruthenium-106 used in other fields other than the medical one; 5) spent fuel treatment, including production of sources from fission product solutions. Nevertheless, IRSN envisaged also as a possible explanation of the contamination unknown events related to irradiated fuel treatments. IRSN found that the most plausible hypothesis to explain the observations might be related to operations in a spent fuel treatment facility located in South Ural region. The following figures 9 shows the corrected concentration in the atmosphere of ruthenium-106 for each monitoring station in Europe and Russia over the whole sampling period during which ruthenium was detected (117). Correction was required in order to compare ruthenium-106 activities amongst different monitoring stations. In the figure it can be observed a decreasing gradient of ruthenium-106 concentration in the atmosphere from East to West. The following figure 10 shows that the most reliable area of the potential release, represented by the darker colours, might be located between Volga and Ural regions (118). According to the results of the IRSN study the estimated source term (from 100 to 300 TBq that corresponds to the ejection of typically 1-4 grams of ruthenium-106) corresponded to an event involving a few cubic meters of fission product solution. However, the study discarded the hypothesis that the source term could be compatible with the activity of medical sources, such as those used in the treatment of ocular cancer, being this latter equivalent to several thousands of such sources, and hence very improbable to occur. If the analysis, the discussion and the results related to the development of an Oranur field reported in the first part of the present article stand, it seems that the situation occurred in the last Fall in western Europe may have all the ingredients of an Oranur reaction and of an associated Oranur field produced by a high concentration of orgone energy units. Indeed, to the type of events theorised by IRSN, as a tentative explanation of the phenomenon, we may add one more by hypothesising that the radioactive field, detected in the European countries and in Russia, might have been produced by an amount of ruthenium-106 kept in an orgone accumulating set-up such as that of the same type we observed in Reich’s and Southgate’s experiments. If we suppose the concentration of orgone units is of the same order to those discussed above, a possibility not much far distant from the reality, and the radioactive field has been produced by an Oranur reaction, the extension of the Oranur (radioactive) field might be considered directly proportional to the effective dose delivered by the amount of ruthenium-106 involved in the reaction. From figure 9 we can see that the modelling carried out by IRSN suggests an extension of a high radioactive field, that might have been produced by the Oranur reaction and where safety measures had to be taken in order to protect the population from radiation exposure, of few kilometers from the release location (between Volga and Ural regions) (119). We can estimate this high radioactive field extension ranging between 5 and 10 km. While the extension of the overall radioactive cloud that spread over West Europe can be estimated in about 3,000-3,500 km (120). The above released activity of 0.19 GBq (or 190 MBq) is undoubtedly an extremely low value, especially when compared to the released activity of 100-300 TGq estimated by IRSN. And the calculated amount of ruthenium-106 of around 1.6 mg is perfectly compatible with what might have been provided, if my analysis is correct, by amounts of ruthenium-106 used in the medical field for radiotherapy of the eye tumour where the activity is ranging between few MBq and several tens of MBq. The following table 5 reports a summary of the most important data related to the two Oranur experiments available in the literature (Reich, 1951; and Southgate, 2018), and those concerning the atmospheric contamination occurred in the Fall of 2017 (IRSN report, 2018). It has to be emphasized that the data concerning the 2017 atmospheric contamination have been determined by assuming that the spreading of the radioactive cloud was the result of an Oranur reaction triggered by an amount of ruthenium-106 put inside a high orgone accumulating set-up. However, confirmation of the above hypothesis might be obtained only by farther and controlled experiments performed by Research Institutes with proved skills both in nuclear and orgonomic fields. Primary and secondary Oranur fields in table 5 are referring to the fields developed around the experimental site characterized by very high radioactive readings, and by low or very low readings, respectively. At this point it is reasonable to think that the ionizing radiation emitted by a radioactive source has the highest influence and degree of excitation on the orgone energy units. All the fields of science and technology that envision the use of a radioactive material might unknowingly create an Oranur reaction, and an associated Oranur field, at different degree of potency and extension in case the user or the recipient, whatever orgonotic system it may be, is characterized by a concentration of orgone energy units higher than that of the background values. The recipient may be a living organism or the same environment. In case of a human organism, all the exams and cures based on the use of a nuclear source might produce an Oranur field inside the organism with all the side-effects typical of the Oranur sickness, such as nausea, vomiting, dizziness, thirst, flu-like conditions, gastro-intestinal problems, etc. CT scan, carried out by using an intravenous contrast medium could be a typical example of a possible production of an Oranur reaction inside the body. Being the contrast medium absorbing X-rays that are taken and diffusely distributed in the organism, it might produce a diffused Oranur field and a collateral Oranur sickness of a degree proportional to the released activity and above all to the amount of orgone units available in the organism. And this situation may hold for all the other exams, and cures that involve the use of a tiny radioactive source that injects, either locally or diffusely, charged particles or photons in the organism. Similarly, the use either of a small or a massive amount of a radioactive source in the environment can create an Oranur reaction and a related field that is depending on the amount of the released activity and on the quantity of orgone energy units available. In the latter case all the living beings in the environment are subjected to the same Oranur field and may develop various Oranur sicknesses whose seriousness is function of the amount of concentrated orgone units each living system is characterized by. From what is above reported and discussed the following conclusions can be drawn. Many of the peculiarities of Reich’s Oranur reaction and of the development of an associated Oranur field has been recently confirmed by an independent research experiment (Southgate, 2018) where an Oranur field produced by a tiny radioactive source (0.26 mg of americium-241) has been detected all around the experimental site by GM counter and field meter measurements. It is plausible to assume that the radium-226 used by Reich during the Oranur experiment at Orgonon in January 1951 was put inside the small charger naked (unshielded). This can be argued both from a literature review and from the similarities with the results of Southgate’s experiment. Higher concentrations of orgone energy units, that can be found both in natural and artificially-produced conditions, can be excited to a various degree by a tiny amount of a radioactive source. Once the Oranur reaction starts it propagates to the nearby units in the space until it vanishes when the energy of the excited orgone units is no longer enough to transmit the excitation to nearby orgone units. From an analysis of the results of the Oranur experiments available in the literature, it seems the extension of the Oranur field might be directly proportional to the effective dose released by the radioactive material used in the experiment, and to the concentration of energy orgone units available in the experimental orgonotic system. The higher the concentration of orgone energy, either in an open or in a closed orgonotic system, the lower the amount of radioactive material required to obtain the same results. In case of a natural standard concentration of orgone energy units, typical of the environment, the amount of radioactive source to obtain the same results is by far higher. The Oranur sickness a living system is developing is not due to the charged particles and the photons emitted by the radioactive source that hit the system, but is given by the reaction of the orgone energy units contained in the system to the ionization action of the radiations that transform the qualities of the orgone units, originally characterized by a dynamic, undulatory and homogenous movement, into a highly chaotic and dis-homogeneous flow. This change of state, at the end, give rise to the typical sickness encountered during the reaction. Oranur field properly contained and controlled might have technological applications such as 1) reducing the decay constant of a radioactive element; 2) energy production (motor force) and antigravity; 3) cure of diseases; 4) and development of higher consciousness states, just to name a few known to date (122). The results obtained in the Oranur experiment are the prime and the best evidence that the Universe and our atmosphere is not empty but filled with a continuum consisting of energetic units or, as Reich called it, orgone energy units whose presence, however, dates back to immemorial times where philosophers and scientists mentioned and discussed it for the first time. According to the above consideration, Einstein’s view and models of the cosmos seem inadequate to represent and explain all the phenomena and the physical realities of our world and need a substantial revision. An update of those models, by introducing the effects of the presence of an energetic medium, is then more than needed. Being an Oranur reaction relatively easy and inexpensive to produce; the extension of the resulting Oranur field go beyond national boundaries; and the associated damages it can produce on living systems and on the environment very high, it should be mandatory that worldwide Radioprotection Governmental Bodies and Competent Authorities, Health Agencies, and Research Institutes must take the responsibility to update their scientific view of the natural and physical phenomena by re-evaluating Reich’s works, and carrying out strictly controlled laboratory experiments in order to explore and verify all the pros/cons of an Oranur reaction and its associated field, and take appropriate measures so that to guarantee the safety and the health of the human beings and of the environment of the whole planet. The author wish to thank Leon Southgate for the critical review of the final manuscript. Reich W, The Anti Nuclear Radiation Effect of Cosmic Orgone Energy, Orgone Energy Bulletin, Orgone Institute Press, Maine, Vol 3, N° 1, January 1951. Reich W, General Meeting – January 3, 1951, HMS, Boston, Box 11 – Material Evidence for Court (Never Presented: Oranur & Orop desert) – Conspiracy. Reich W, General Meeting – January 3, 1951. Oranur was coined by Reich as an acronym for Orgonomic Anti Nuclear Radiation. Reich discussed the properties of the Orur or Oranur radium in detail in his last book Contact with Space (Core Pilot Press, Usa, 1957). Currently the book is published by the Wilhelm Reich Museum. A critical review of the properties of the Orur and its applications can be found in Maglione R, The Legendary Shamir, GEDI Gruppo Editoriale, Milan, 2017, pages 323-363. Reich W, Reich W, The Oranur Experiment: First Report (1947-1951), The Wilhelm Reich Foundation, Rangeley, Maine, 1951, page 274. 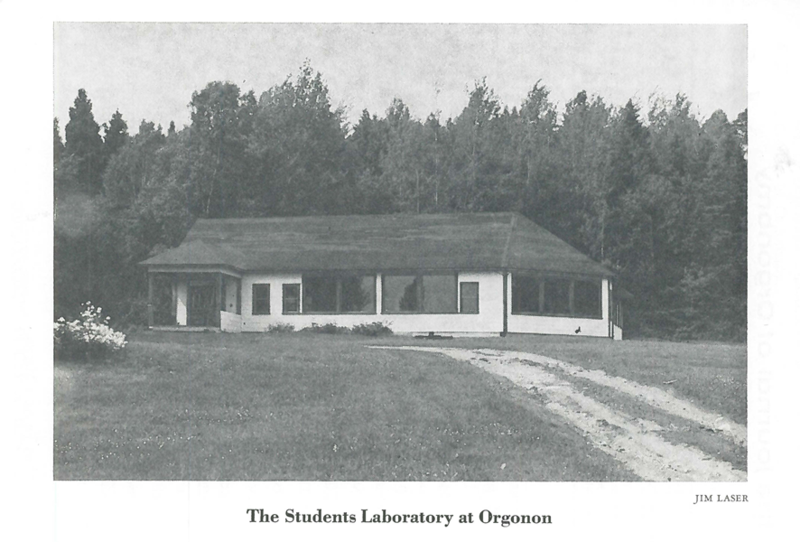 The Oranur experiment took place at Orgonon’s laboratories, in Maine, in the first half of January, 1951. 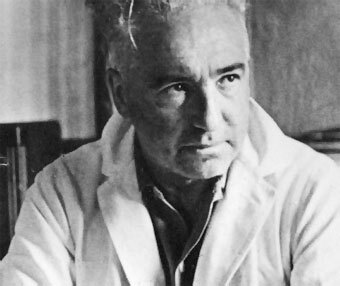 Reich W, Reich W, The Oranur Experiment: First Report (1947-1951), The Wilhelm Reich Foundation, Rangeley, Maine, 1951, page 277. Reich does not describe here the characteristics of the small orgone charger he used. It can be presumed it was a small 1-fold orgone accumulator of the same type used later on to contain the radioactive source utilized in the Oranur experiment. Besides, it is known from the literature that zinc sulphide is not a radioactive chemical substance and exhibits properties of phosphorescence when struck by charged particles. According to Wilcox (The Oranur Experiment, March 30, 2002, paper available online) what Reich measured was not just plain zinc sulphide, but was some other, radioactive substance mixed in with it in order to have been radioactive. Wilcox hypothesized that what Reich referred to as "radioactive zinc sulphide" was the same concoction used in radium wristwatch dials, namely, zinc sulphide with radioactive radium mixed in, in order to make the zinc sulphide glow in the dark, and possibly with also the addition of a little bit of silver. Reich W, Ibid, pages 274-275. Here Reich does not specify whether the radioactive zinc sulphide, was kept inside the small charger naked or inside the ¼” lead shielding. Reich W, Ibid, page 336. Application for the radioisotopes procurement to Radioisotopes (RI) Branch of AEC (Oak Ridge, Tennessee) was done by telegram on December 4, 1950 by Reich (OIRL). Response to Reich by RI Branch AEC was done by letter on December 6 (application) and December 15 (procurement), 1950. Later Reich ordered two mg of radium-226 needed for the experiment to the Canadian Radium and Uranium Corp, NYC. The company responded by letter on January 3, 1951 (Reich W, Ibid, page 339). The two units arrived at Orgonon two days later. According to Eden, in the middle of December 1950 Reich applied to the AEC for 20 mCi of phosphorus-32 (P-32). The ordered nuclear material either was delayed or never arrived at Orgonon. Reich thereupon ordered two mg of pure radium from a private laboratory (he does not specify which it was) that arrived at Orgonon on January 5, 1951 (Eden J, Orgone Energy. The Answer to Atomic Suicide, Exposition Press, Inc, New York, 1972, pages 94-95). It is interesting to note here that Eden reported that on the same day of the arrival one of the two units of radium kept in its lead container was placed in a garage some distance from the laboratory. The second unit was placed in a strong orgone energy accumulator that was itself located in the orgone room without specifying whether it was shielded by its lead container as he clearly reported for the control unit (Eden J, Ibid, page 95). The students’ laboratory is the premise which contained the orgone room and where the Oranur experiment was carried out. The orgone room was a 1-fold orgone accumulator with size of 18 x 18 ft (around 5.5 x 5.5 meter). According to Reich, on the basis of many subjective as well as objective observations, the whole region of the 280 acreage at Orgonon possessed a much higher level of orgone energy than any other region, due to the continuous work that had been carried out there for many years (Reich W, Ibid, page 310). As a consequence of this, due to the radioactivity being proportional to the content of orgone energy units, the natural background at Orgonon just before the Oranur experiment was at least twice the natural background the area possessed some years earlier (before Reich started all his research activities with orgone devices), i.e. 8-15 CPM (Reich W, Ibid, page 226). Reich W, Ibid, page 275. Reich W, Ibid, table at page 280. Reich W, Ibid, figure 12 at page 279. 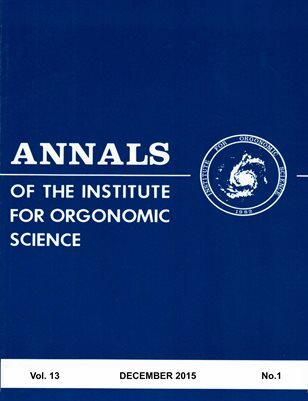 Journal of Orgonomy, Vol 11, N° 1, May 1977, Orgonomic Publications, New York, Usa, figure at page 2. Reich W, Ibid, page 279. Reich W, Ibid, page 281. Reich W, Ibid, page 282. Reich W, Ibid, page 283. Reich W, Ibid, pages 283-284. Reich W, Ibid, pages 283-284; and 287-288. Reich W, Ibid, page 337. Reich W, Ibid, page 300. Reich W, Ibid, pages 298-299. Reich W, Ibid, page 296. In The Oranur Experiment book at page 309 Reich stated that all the nuclear materials that were used in the Oranur experiment were put inside a safe with heavy 4” walls of steel and cement and put half a mile (around 805 meter) away from the laboratory. Reich W, Ibid, pages 309 and 317. Reich W, Ibid, page 312. Sharaf M, Historical Notes. Some Notes on Oranur – March, 1951, a 7-page typed letter dated March 15, 1951, Reich’s Archive, HMS, Boston, Box 11 (Material Evidence for Court). Reich W, Ibid, page 331. Reich W, Ibid, page 292. Reich W, Ibid, page 332. Reich W, Ibid, page 334. Measurements were done by a Tracerlab SU-5 GM counter. Reich W, Ibid, page 317. Reich W, Ibid, page 318. These mice were not those used in the Oranur experiment three months earlier. Reich W, Ibid, page 320. Reich W, Ibid, page 321. The sizes of the inner space of the safe were 40 x 40 x 50 cm. For a same amount of radium-226 in standard environmental conditions (never been affected by exposure to high orgone charges) the reading at 1 cm naked was about 16,000 CPM. Reich W, Ibid, page 323. Reich does not specify here whether the nuclear material was put inside the great charger naked or inside its lead shielding. Reich W, Ibid, page 324. Reich W, Ibid, page 323. Measurements were done by a Tracerlab SU-5. Reich W, Ibid, data averaged from those reported in the table at page 323. Reich W, Ibid, page 325. Reich W, Ibid, page 327. Reich W, Ibid, page 328. Reich W, Ibid. See for instance reference to the experimental activities at pages 278, 281, and 283. Reich W, Ibid, page 280. Maglione R, the Legendary Shamir, GEDI Gruppo Editoriale, Milan, 2017, pages 114-158. An alpha particle is a nucleus of a helium atom, with the two orbiting electrons missing. It is characterized by a positive electric charge. This kind of particle loses energy quickly as soon as leaving the radioactive element. Ultimately, all alpha particles may find two electrons in the environment and become atoms of helium gas. If radium-226 is kept in a closed container the alpha-particles can combine with the electrons emitted by the metal walls of the container as a consequence of the ionization effect of the gamma-rays of the radioactive source on the metal. The phenomenon may occur when the metal, the walls of the container are made of, is available in nature in different isotopes and is unstable. In this case the alpha particles may find two electrons in the closed environment and form an atom of helium in the gas state (Gofman JW, Radiation and Human Health, Sierra Club Books, San Francisco, Usa, 1981, page 27). Radioactive Material Safety Data Sheet, Stuart Hunt & Associates, Alberta, Canada. Reilly D, Ensslin N, Smith H (Edited by), Passive Nondestructive Assay of Nuclear Materials, United States Nuclear Regulatory Commission, Washington DC, 1991, pages 31-42. The build-up factor (B) has been introduced in the classical Lambert-Beer equation to take into account conditions of poor geometry, i.e. for a broad beam or for a very thick shield, in that the classical equation of the emerging intensity (for B = 1) underestimates the intensity of the radiations transmitted by a shield thickness. The build-up factor assumes that under conditions of poor geometry a significant number of photons may be scattered by the shield into the detector, or photons that had been scattered out of the beam may be scattered back in after a second collision, so it includes both the contribution of the primary and the scattered radiations, at any point in a beam. It is always greater than 1, and have been calculated for various gamma energies and for various absorbers. In general, it is a function of the attenuation coefficient, the thickness of the shielding material L, and the energy of the gamma radiation. Reilly D, Ensslin N, Smith H, (Edited by), Ibid, pages 27-28. Reilly D, Ensslin N, Smith H, (Edited by), Ibid, page 30. Acronym for Federal Emergency Management Agency. Acronym of International Commission on Radiological Protection. Acronym of United States Nuclear Regulatory Commission. The effective dose determines how dangerous an individual’s exposure to radiations can be. It takes into consideration not only the nature of the incoming radiation but also the sensitivities of the body parts affected. The unit of effective dose is the sievert (Sv), the same unit as is used for the equivalent dose absorbed locally by an organ, a gland or any other part of the body. Examples of effective dose are the doses resulting from a year exposure to natural radioactivity, radioactivity encountered in the workplace, radiation emitted by medical testing and finally accidental exposure to radioactivity. In an European country like Italy, the population is exposed each year to an average effective dose of about 4.5 mSv per capita. This value is the combination of different contributions such as natural radioactivity (2 mSv), of radioactivity of medical origin (1.2 mSv), and radiation linked to other human activities including nuclear (1.3 mSv). Italian regulations set at 1 mSv per year maximum admissible effective dose resulting from human activities outside the radioactivity from the above expositions. Acronym of United Nations Scientific Committee on the Effects of Atomic Radiation. – administration of stable iodine, when the thyroid dose is likely to exceed 100 mSv. Specific activity is the activity per quantity of a radioactive source and is a physical property of that radionuclide. Activity is a quantity related to radioactivity, and is a measure of the number of disintegrations occurring per second in a particular radioactive isotope, or how many rays are emitted in that time. The units of activity are the becquerels (Bq), where 1 Bq is the activity of a substance that has one nucleus decaying per second. Generally, becquerels are small units, and kilo (kBq), mega (MBq) and giga (GBq) becquerels are more frequently used. Its related and more common unit is the Curie (abbreviated Ci) which is 3.7 x 1010 transformations per second. Since the probability of radioactive decay for a given radionuclide is a fixed physical quantity, the number of decays that occur in a given time of a specific number atoms of that radionuclide is also a fixed physical quantity. Thus, specific activity is defined as the activity per quantity of atoms of a particular radionuclide. It is usually given in units of Bq/g, but another commonly used unit of activity is the curie (Ci) allowing the definition of specific activity in Ci/g. Delacroix D, Guerre JP, Leblanc P, Hickman C, Radionuclide and Radiation Protection Data Handbook, Nuclear Technology Publishing, Ashford, England, 2002, page 147. Reich W, Ibid, page 278, and page 319. Reich W, Ibid, pages 309-310. Reich W, Ibid, page 278. Reich W, Ibid, page 295. It should be pointed out here that the one-cubit-foot OR charger is not the one used to contain the experimental one-mg needle of radium-226 of the Oranur experiment. Indeed it contained a scintilloscope for alpha particles observation which was characterized by a fraction of a microgram of radium. 3) Orgonomic Geiger-Muller Reaction Experiment XXI – Preliminary Communication, a 12-page typed and handwritten document dated (Forest Hills) November 18, 1947, available at Reich’s Archive, HMS, Boston, Box 13. In this latter document Reich reports the construction plan of one cubit foot 3-fold orgone accumulator. The intermediate layers are built with alternating layers of steel wool and rockwool. No mention is done on the materials used for the inner and outer layers. In the appendix of the Oranur Experiment book (page 335) Reich reports that the orgone room can be lined with a sheet metal of iron or steel (no copper or aluminium). Between the inner iron metal lining and the outer walls he suggested to put a layer of ordinary glassfiber insulation in order to increase the effectiveness of the accumulation. Besides, the orgone room should have been made light-tight in order to make possible the observation of orgone energy in the dark. In a further document (Orgonomic Geiger-Muller Reaction Experiment XXI – Preliminary Communication, Reich’s Archive, HMS, Boston, Box 13) Reich mentions the construction of a special room, sized 15 x 15 ft whose walls should be lined inside on all six walls with sheet of iron (gauge 26-32), and with matter like Celotex outside. Reich pointed out that the thickness of the layer was not an important issue. Reich W, Ibid, page 314. Huthsteiner C, Personal Communication, March 29, 2018. Reich W, Ibid, page 280. In the table of distances at page 280 Reich reports the distance between the mice and the orgone room to be 40 feet. In order to determine the distance of the mice from the radium-226, to the above value it should be added the distance of the 20-fold ORAC from the orgone room (6-7 feet) (Reich, Ibid, page 280), the distance between the small charger and the 20-fold ORAC (about 2 ft), and the distance between the radium-226 and the inner layer of the small charger (about ½ ft). The height of the 20-fold ORAC is not known. Density of the glass fiber for a ½” slab thickness has been taken from the data reported for fiberglass insulation slabs produced by National Industrial Co, Tamil Nadu, India. Density for Celotex has been taken from Celotex TB4000 Product Data Sheet, August 2016, Celotex Saint Gobain, UK. The value of the mass attenuation coefficient (in Ero’s paper) was the one given for Melaina wood, being characterized by a density similar to that of Celotex (0.42 g/m3). Reich W, Ibid, pages 281, and 283. Clark RW, Einstein: the Life and Times, World Publishing Co, New York, 1971, page 328. For more details on the work of Einstein and its correlation with the work of Reich’s and orgone energy see Maglione R, The Motions of Life. Was Einstein Really Modeling Brownian Motion? GEDI Gruppo Editoriale, Milan, 2014. Today the situation is little more complicated by the presence in the atmosphere of gases and particulates, that at the time of Einstein and Reich were not present or were available in very low percentages, such as CO2, CO, NOx, SOx, O3, VOC, CFCs, and PMs. Reich W, Ibid, page 336. To the above causes Eden added also gasoline as a secondary source of energy that could irritate the orgone units into higher and higher states which are deadly to the living. It has to be supposed that gasoline might be a representative of those families of chemical compounds that can be transformed into secondary energies with the collateral productions of chemical pollutants that are discharged into the atmosphere (Eden J, Orgone Energy. The Answer to Atomic Suicide, Exposition Press Inc, New York, 1972, page 101). Indeed, according to Eden, Reich thought that industrial particulates and noxious gases do not disperse when DOR is present in the atmosphere; and he found that a direct relationship exists between industrial pollution and DOR infestation, being the one enhances the other (Eden J, Planet in Trouble. The UFO Assault on Earth, Exposition Press Inc, New York, 1973, page 41). In further passages of the same book Eden stated that atmospheric orgone energy can be irritated out of thermal, mechanical, electrical, and nuclear energy also by chemical energy (Eden J, Ibid, pages 87 and 91). Nevertheless, Reich observed that a small degree of excitation of the orgone units had healing and life-positive qualities. This would be discussed later in the paper. Most of Reich’s last book Contact with Space (Core Pilot Press, USA, 1957) is focused on discussing the theoretical and practical possibilities of this reversal process. By use of specific apparatus Reich demonstrated that it is possible to break up epochal DOR aggregations in the atmosphere and take them back to dynamic, and flowing orgone energy units. Reich W, Ibid, page 270. More details on this issue can be found in Reich W, Ether, God and Devil. Cosmic Superimpostion (Orgone Institute Press, USA, 1947). For more details on the relationship between consciousness and orgone energy units see Southgate L, Implications of Orgone for Consciousness Research, Part 1 and Part 2, Journal of Psichiatric Orgone Therapy, January 4, 2018. Reich W. Ibid, page 332. Sharaf M, Historical Notes. Some Notes on Oranur – March, 1951, letter dated March 15, 1951, Reich’s Archive, HMS, Boston, Box 11 (Material Evidence for Court). Sharaf M, Human Orgone Energy Aroused and Angered by Human “Nuclear Energy” – The Similarities Between Aroused COE and Aroused OOE, Jan 26, Reich’s archive, HMS, Boston, Box 11 (Material Evidence for Court). A 3 and a half typed-page letter with some hand corrections. The year in which the letter was written is not reported but it can be supposed it was 1951 in that the document seems to have been written soon after the conclusion of the Oranur experiment. Southgate L, Preliminary Experiments with Electrical Capacitance, Temperature, Radioactivity, Luminescence and other Observations associated with Controlled Oranur in a Strong Orgone Device, Journal of Psychiatric Orgone Therapy, April 19, 2018. Americium is a synthetic chemical element first produced in 1944 by Seaborg and his group at the University of California. Most americium is produced by uranium or plutonium being bombarded with neutrons in nuclear reactors. About 19 isotopes and 8 nuclear isomers are known for americium. Americium-241 has a half-life of 432.2 years and decays to Neptunium-237 emitting alpha particles of 5 different energies, mostly at 5.486 MeV (85.2%) and 5.443 MeV (12.8%). Because many of the resulting states are metastable, they also emit gamma rays with the discrete energies between 26.3 and 158.5 keV. Specific activity of americium-241 is 127 GBq/g (or 3.43 Ci/g); and dose rate due to gamma-rays emission point source is 39.717 mSv/h/GBq at 1 cm distance. Southgate observed a strong field extending about 2 foot (0.61 m), a less strong one to about 6 foot (1.83 m), and again to 24 ft (7.3 m) and 40 ft (12.2 m) or more. Besides, he inferred it might even be a weak field extending further. Southgate L, Personnel Communication, May 09, 2018. Reich W, Ibid, page 331. For completeness of information it should be reported that three weeks later the conclusion of the Oranur experiment, in the last week of January, an unusually high background count, according to the New York Times, was spreading from Rochester, New York (Eastern USA), to Eastern Canada. The area formed a circle of 300-600 miles (about 483-966 km) around Orgonon, considered as an approximate centre. To Reich it seemed that these high values of radioactivity were the consequence of the Oranur field created at Orgonon during the experiment and that travelled to West, for 600 to 700 miles (about 966-1,126 km) in the 21 days after the conclusion of the experiment, against the general West-East direction of the orgone energy envelope. Reich calculated that the speed by which the radioactive cloud moved was of some 30-35 miles per day (around 48-56 km per day), or little less than 1 ¼” miles per hour (about 2,010 m per hour) (Reich W, Ibid, page 293). However, no clear and definite evidence was found regarding the Oranur reaction triggered at Orgonon as the potential responsible of the radioactive cloud found in Eastern USA and Canada. A similar phenomenon was also seen by Southgate in his experimentation. He observed an increase of the extension of a mild Oranur field in the weeks after the conclusion of the experiment from 18-24 ft (about 5.5-7.3 m) to about 40-50 ft (about 12.2-15.2) (Southgate L, Personal Communication, May 04, 2018). Southgate L, Personal Communication, May 01, 2018. Calculation of the gamma-ray transmission coefficient for PVC was done considering a mass attenuation coefficient of 0.3325 cm2/g, and a density of 1.40 g/cm3. Ruthenium-106 is a radionuclide of artificial origin. It is a fission product from the nuclear industry and can only be produced in irradiated nuclear fuels or in irradiated uranium targets. It has a radioactive half-life of 371.8 days. By disintegrating, ruthenium-106 is transformed into rhodium-106 with half-life of 30 seconds. It is a pure beta emitter but given the very short half-life of its descendant, it is generally at radioactive equilibrium with rhodium-106 which is an emitter of gamma radiation. Ruthenium-106 is used in the medical field (eye tumour treatment). The sources used in this context have activities of a few MBq to several tens of MBq. Institut de Radioprotection et de Sureté Nucléaire (IRSN), Report on the IRSN’s Investigations Following the Widespread Detection of 106Ru in Europe Early October 2017, January 2018, available at www.irsn.fr. Ruthenium-103 can be formed either by fission reaction or as the result of the irradiation of ruthenium-102. It has a half-life of 39.3 days. IRSN, Ibid, figure 3 at page 5. IRSN, Ibid, figure 5 at page 11. Brumfiel G, Mysterious Radioactive Cloud over Europe Hints at Accident Farther East, The Two-Way, November 10, 2017, article available online. It is interesting to note that the ruthenium-106 radioactive cloud spread all over West Europe with a velocity of about 3,000/22 = 136 km/day. A velocity quite comparable with that observed by Reich at Orgonon after the conclusion of the Oranur experiment of 48-56 km per day, and that spread over Eastern USA, and Eastern Canada. Besides, the direction and the duration of the contamination in the atmosphere were similar in both cases, with an East-West direction and a duration of 21-22 days. Delacroix D, Guerre JP, Leblanc P, Hickman C, Radionuclide and Radiation Protection Data Handbook, Nuclear Technology Publishing, Ashford, England, 2002, page 88. All the above listed applications had been very little or not at all discussed in the present paper, and the reader might refer to the following publications for more details: Reich W, The Oranur Experiment: First Report (1947-1951), The Wilhelm Reich Foundation, Rangeley, Maine, 1951; Reich W, Contact with Space, Core Pilot Press, USA, 1957; Maglione R, Methods and Procedures in Biophysical Orgonometry, GEDI Gruppo Editoriale, Milan, 2012; Maglione R, The Legendary Shamir, GEDI Gruppo Editoriale, Milan, 2017; Maglione R, Reich’s Orgone Energy. A Portal towards Higher Levels of Consciouness? (in italian), In Glielmi N, Fontana M, Maglione R, Valleri T, Argomenti Reichiani, GEDI Gruppo Editoriale, Milan, 2007; Maglione R, Mazzocchi A, Etheric Energies and Places of Worship. The Religious Site as a Therapeutic Place. A Pilot Study on 62 Ancient Sites (in Italian), Advanced Therapies, Vol VI, N°11, 2017, Nuova Ipsa, Palermo; Milián-Sánchez V, Mocholí-Salcedo A, Milián C, Kolombet VA, Verdú G, Anomalous Effects on Radiation Detectors and Capacitance Measurements inside a Modified Faraday Cage, Nuclear Instruments and Methods in Physics Research A, 828(2016)210–228; Scholkmann F, Milian-Sanchez V, Mocholì-Salcedo A, Milian C, Kolombet VA, Verdù G, Anomalous Effects of Radioactive Decay Rates and Capacitance Values Measured inside a Modified Faraday Cage: Correlations with Space Weather, Europhysics Letters, 117, 62002, 2017; Maglione R, Electric Currents in Orgone Devices. The Route towards the Reich Orgone Motor? A State of the Art, Journal of Psychiatric Orgone Therapy, August 27, 2017; Maglione R, Ferrari D, Electric Currents in Orgone Devices. The Route towards the Reich Orgone Motor? Early and Mid-term Laboratory Experiments with Orgone Apparatus, Journal of Psychiatric Orgone Therapy, September 26, 2017; Maglione R, Ferrari D, Electric Currents in Orgone Devices. The Route towards the Reich Orgone Motor? A Hypothesis on the Y-factor, Journal of Psychiatric Orgone Therapy, October 27, 2017; Southgate L, Implications of Orgone for Consciousness Research, Part 1 and Part 2, Journal of Psychiatric Orgone Therapy, January 4, 2018; and Southgate L, Preliminary Experiments with Electrical Capacitance, Temperature, Radioactivity, Luminescence and other Observations associated with Controlled Oranur in a Strong Orgone Device, Journal of Psychiatric Orgone Therapy, April 19, 2018. Roberto Maglione - who has written 6 posts on The Journal of Psychiatric Orgone Therapy. 1 Scholar, and author in orgonomy. Italy www.orgonenergy.org, Email: robert_jumper@yahoo.it. Degree in Mining Engineering. Love, work and knowledge are the well-springs of our life. They should also govern it.